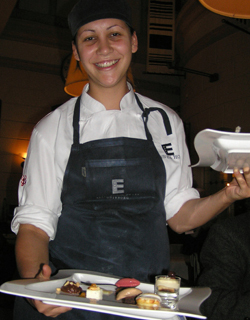 During a stay at the Elite Plaza Hotel in August 2005, Edward F. Nesta and I had breakfast and dinner at their restaurant Svea Hof, and were very impressed with Chef Björn Tagesson’s creative menu. 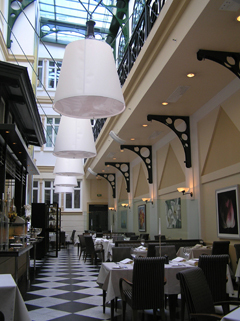 Breakfast is a delicious buffet affair in their bright and spacious 20 meters high glass ceiling restaurant. In the evening, the restaurant takes on a more formal atmosphere, with cafe au lait colored tablecloths, and cream colored napkins monogrammed with Svea Hof. Tealights set in silver disk holders create a warm ambience at the tables, while tall white tapers in silver candlesticks provide additional radiance. There is an open kitchen where guests can watch the chefs in action. 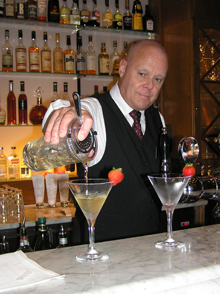 We began our evening at the hotel’s intimate Plaza Bar, where Barman Lars Nydeń presides over the wood paneled bar with expertise. The bar is known for their Martini Menu, and we indulged in Fläder Draja Martinis, made with Hallandsfläder, Noilly Prat and Martini & Rossi vermouth. This martini was the perfect summer evening cocktail, especially when combined with their bar snacks of shrimp and dill on toast, and foie gras with fig marmalade. After our cocktails, we went into the dining room just as a tempestuous rainstorm commenced. We could see the lightning and hear the rain beating down on the glass ceiling, making us very appreciative of being warm and comfortable inside. 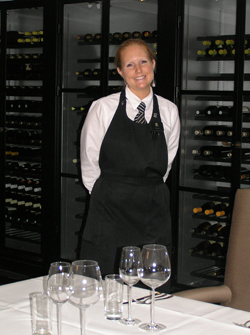 Our server, Hanna Johansson, brought us a glass of “Svea Hof” Cuvée de Réserve, Blanc de Blanc, Pierre Peters Brut. The wine was fresh, crisp with lemons and green apple en bouche, with a very active stream of bubbles. We began with a lovely cold seafood plate of Swedish shrimp and crayfish served with a saffron mayonnaise, Swedish whitebait roe, oysters, smoked and cured salmon, and cured herring served with a spicy mustard sauce. Marie Kortteninen, the Sommelier paired Gravit, a Swedish beer to drink with the herring, and a 2004 Pinot Grigio, Elena Walch, Alto Adige, with a vanilla nose, and white peaches and vanilla en bouche, with a crisp finish to pair with the other seafood. At the chef’s suggestion, for our next course, we selected the Lobster and cep bisque with glazed lobster and roasted cep (Hummer och karl-johansvamp bisque med glaserad hummer), which was pure heaven. Lobster bisque lovers, drop everything, and take the next plane to Göteborg, it was that good! It was a lovely mixture of intense flavors and textures from the creaminess of the bisque, to the crunchy, diced fennel, and abundant lobster claw meat and large mushrooms. Between courses, we were served a delicious vanilla and lemon granita as a palate cleanser. For Edward’s main course he selected the Roasted filet of venison with a small venison meatball and mushroom ragu, spicy ligonberry ketchup and whey butter gravy (Rosastekt hjortinnerfilé med skogssvampsragu, kryddig ligonketchup och messmörssky, which was paired with a 2001 Château Calissanne, Cuvée Prestige, Coteaux D’aix-en-Provence, a blend of 50% Cabernet Sauvignon and 50% Syrah, which had heavy tannins, and a very aromatic earthy nose. En bouche, it was spicy, with black pepper and deep black cherries. This wine would have benefited from decanting before serving to tame the tannins and open up the wine. I selected the Seared perch with chanterelle, fennel, cucumber and white port wine sauce (Halstrad abborre med kantareller, fänkål samt vit portvin sås och prästostpotatis), which was paired with a 2000 Bourgogne Chardonnay, Maison Fery-Meunier, which had a lemony, citrussy nose, and worked well with the perch. Our sommelier paired our Svea Hof’s selected cheese plate with fruit paté (Svea Hof’s utvalda ostar med tillbehör) with a 1999 Chateau Suduiraut 1er Cru, Sauternes, from France, as well as a 10-year old Malmsey, Cossart Gordon, Madeira, Portugal, which was especially wonderful with the blue cheese and boiled plums. For dessert we sampled their Warm cloudberries with white chocolate semifreddo and pancakes (Varma hjortron med vitchoklad semifreddo och nystekta pannkakor), Roasted strawberry ice cream, Tiramisu with chocolate foam, peanuts and a Brownie, which was paired with a 2003 Moscato d’Asti, Prunotto, Piemonte, Italy, which had a floral, rose nose and was fruity on the palate; a 2000 Tokaji Aszú 4 Puttonyos, Disznókö, Hungary, and a Liqueur Muscat, Brown Brothers, Victoria, Australia, which was wonderful with the chocolate and strawberry ice cream. After dinner Hanna took us on a tour of their wine cellar, which is located in the former Svea Fire and Life Insurance Company vault, where guests actually enter through the safe doors. Read more about Göteborg in our Hotels & Resorts, Restaurants and Chefs’ Recipes sections.